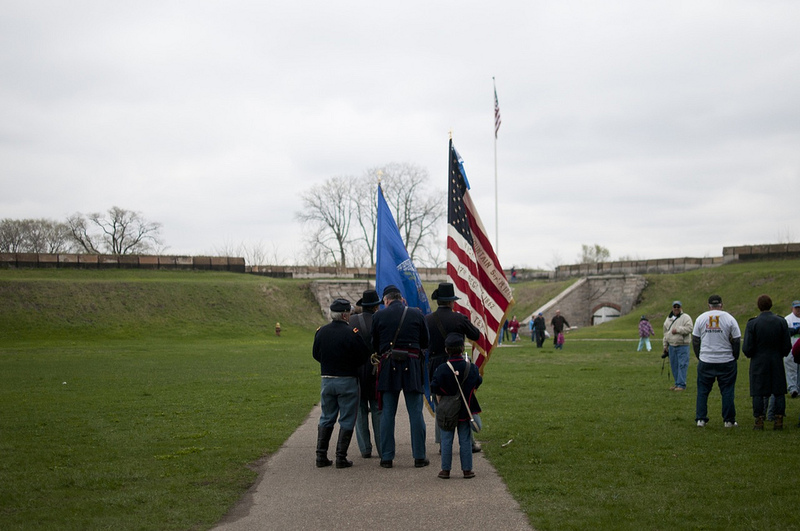 We had the pleasure of spending some time at Detroit's historic Fort Wayne during a recent volunteer "cleanup day," and we were blown away by what we saw there. 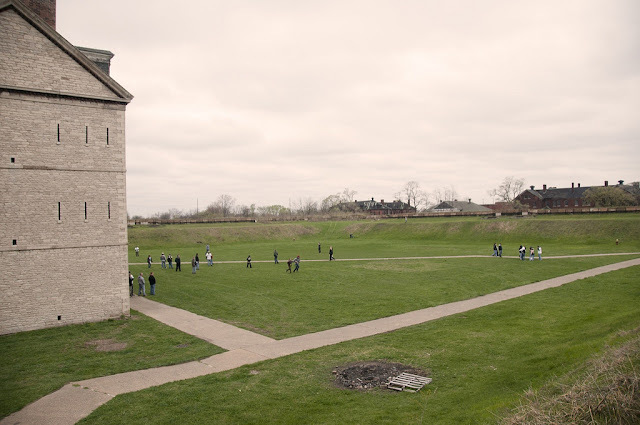 I hadn't visited the fort in a few years, and I was extremely impressed with the work that the Historic Fort Wayne Coalition had done to preserve the fort and present it to this community. The Coalition formed in 2004, and includes many suburban residents who care deeply about this historical site within the city of Detroit, and have taken up the burden of its care and restoration while the city's budget is stretched too thin. I cut a section about Fort Wayne from my recent post about "Fauxtopias" in Detroit's suburbs, because that post was really, really long. But I think the Fort really represents what I'm talking about when it comes to historic preservation and the city of Detroit. Here is a truly historical site within the city of Detroit set up naturally as a military "village." There are officers' single homes, apartment-like barracks, recreation facilities, a theater, a hospital, a service club, and many more buildings. Most were built in the 1880s (but some as old as the 1840s). The highlight is the star-shaped brick and earthworks fortress itself beyond the moat, and the beautifully-maintained federal-stye 1848 limestone barracks within. Unfortunately for these buildings and the people trying to restore them, Fort Wayne sits in the middle of one of the most downtrodden and depressing neighborhoods in this city full of downtrodden and depressing neighborhoods (note: I like Delray; a lot people don't). If it had been located east of downtown, I have no doubt it would be better funded and well-visited by tourists. It's really that cool. Sadly, it's situated along the river in Delray, between the Ambassador Bridge and the proposed site of a new truck bridge to Canada, surrounded by abandoned industrial buildings, chemical plants, the city's sewage treatment facilities, and the pollution billowing Mordor-like landscape that stretches from Zug Island to the Ford River Rouge plant. 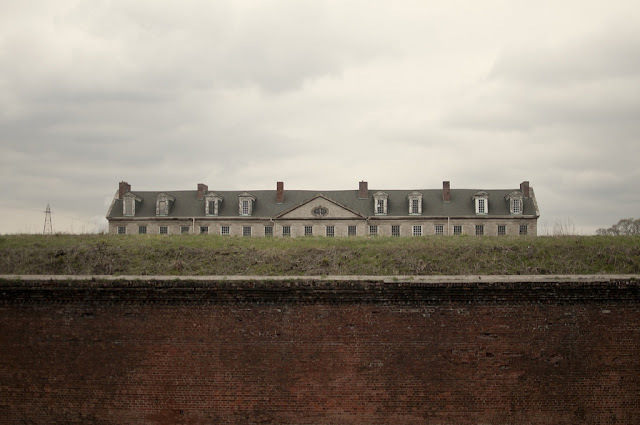 Looking around at all the abandonment, it seems almost perverse that a fort was built here to offer protection against feared Canadian belligerence. Today one must wonder what this fort was meant to protect. Although the fort is very historical, its decline was hastened by the fact that there wasn't much history-book material made there. Built in 1843 to defend against attacks from Canada that never came, the star-shaped fortifications were strengthened during the Civil War (though no shots were ever fired from its walls). It was used as a garrison post, a supply depot, and housing for depression-era homeless. My father went there in one if its last years of military operation for his entrance and examination physical during the Vietnam draft. Without a military presence, the fort has become a dedicated community space. Today it's used for reenactments, youth soccer games, flea markets, and boy scout events. The grounds are great for picnics. You can rent them out for wedding receptions or family reunions. There are frequent "ghost hunts" with a local paranormal society. The grounds also boast a museum for the Tuskegee Airmen, an Indian burial mound, and the Great Lakes Indian Museum (it should be noted that the area's Native American history is largely ignored in the suburban Fauxtopias I wrote about here). There's also a secret collection of displaced statuary and architectural elements from historic buildings that have been torn down in Detroit over the years, including the old city hall statues. Though both are walled off from the rest of the region, Fort Wayne is everything that Greenfield Village isn't: it was built for an actual historic purpose, organically designed and developed, and completely authentic (if somewhat lacking in specific historical significance). Its buildings were built on this spot and are stuck there for better (or probably) worse. Unlike Greenfield Village, it has no paid curators or preservation workers (relying instead on volunteers). 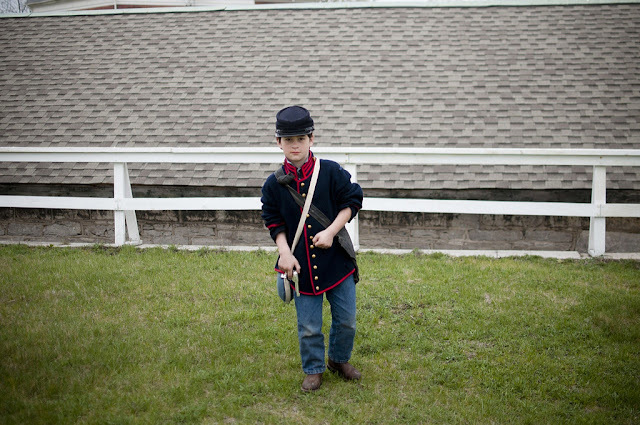 Its frequent reenactments are all staffed by volunteers as well. It is visited by a few thousand people every year rather than the 1.5+ million who visit the Henry Ford/Greenfield Village. It doesn't have an entrance fee. And despite the valiant efforts of its volunteer caretakers, much of it is still falling apart. This is Detroiters doing history right. I look forward to seeing what the Coalition does in the future.